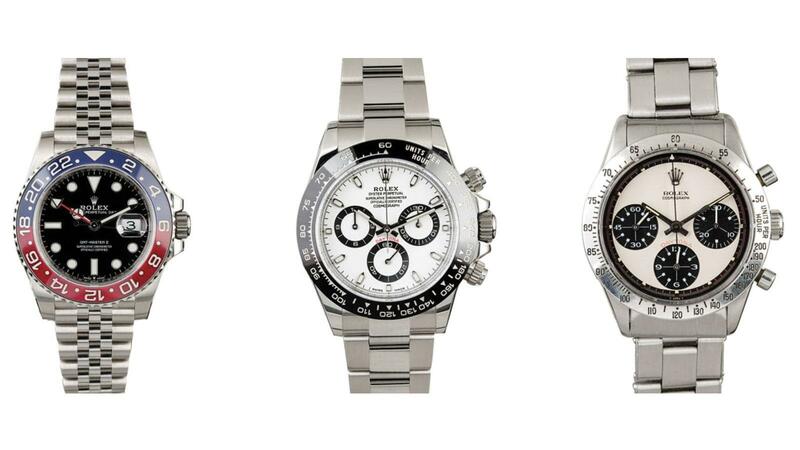 Notable Rolexes on the auction block include (from left) the 2018 GMT Master 126710, the Daytona 116500LN, and the star lot, a 1969 Ref. 6239 Daytona, the same model worn by Paul Newman. As Rolex fever continues to rage in the vintage, pre-owned and contemporary markets, Bob’s Watches, a leading pre-owned Rolex dealer site, is entering the auction market with a special sale of 12 lots. The auction runs September 5 to 12 and poses a bold challenge to the big auction houses: no buyer’s premiums. The premium is an additional fee—typically 25 percent on sales up to about $175,000 and then 20 percent above it—that buyers pay to close the deal. With extremely rare Rolexes, such as a few coveted Paul Newman Daytonas selling in the high six- and seven-figures in recent months, that’s a serious upcharge. Last fall, Newman’s personal Daytona hammered at Phillips in New York for $15.5 million, though in the end, the buyer shelled out $17.75 million. Bob’s Watches can manage its first multi-piece auction without charging the fees because it draws from the personal collection of its owner, Paul Altieri, one of the world’s foremost Rolex collectors with some 150 watches. The star of the show is Lot 8, a 1969 Ref. 6239 Daytona, the same entry-level model that Newman wore. The starting bid is $175,000, and Altieri expects the watch to go for about a quarter-million dollars. Given recent auction results, it could go much higher. Altieri acquired the rare bird from an 87-year-old retired physician who wore it every day for decades. It was originally a gift from his wife, who purchased it for $250 in the 1970s. The original sales tag that comes with the watch, along with the box and papers, verifies this. One of the criteria for selecting watches for the sale was to only include models that come with the original box and papers, assuring authenticity. “Maybe one in 100 vintage watches have the original box and papers, so that makes them exceptional,” says Altieri, who notes that serious collectors want that paperwork. The idea of the sale came from Altieri’s friend Eric Wind of Wind Vintage, who formerly worked at Christie’s as a watch specialist.